There will be a Presentation/Workshop tailor-made to Ratepayers Victoria on 4 March 2017, 1pm-4pm, Knox Council Offices. See inside for details. 1PM-4PM Starting at 1PM Sharp. Rates have been capped at 2.0% for 2017-2018 and Essential Services Commission has held workshops with councils about process and what is required for any cap variation. The workshop will provide an understanding of the expectations the Commission has of councils when they apply for a higher cap. Of particular interest is the requirement for legitimate consultation. Complaints to the Inspectorate are many times rejected causing much frustration to ratepayers and residents. The IBAC presentation will be customized to this issue and you will have a better view of how to use the inspectorate to insure results. These presentations will make it easier to monitor the performance of councils and help take corrective actions and get results when necessary. We all experience and we constantly read of how the traffic in Melbourne is unbearable, yet we are told by our criminal government that it will get worse, although they have the power to stop it by reducing immigration. And the Age, whilst posing as some kind of left wing hold out, supports this nightmare growth all the way, despite apparently forthright articles which simply accept this outrage, as in the one cited below, which concludes, uselessly, "I don't mean to be unduly negative. Melbourne remains a cool place to live. But it is also just another big city that is rapidly getting bigger, more expensive, more troubled. Underpinning many of these problems are unsustainable rates of population growth. Unless we wake up to this, our problems will only continue to grow." Unless "we" wake up to this? We all bloody know it! And so do the politicians. And they want it to get worse. They should be put on trial for treason. That's the only thing we could do, in theory, to stop this - but they are untouchable! Why? How? "Melbourne is growing at an unsustainable pace. As it is, one-third of car trips happen on congested roads during the morning peak. The bad news is that it's only going to get worse. According to Infrastructure Victoria, in coming decades the city is going to become so clogged that the average speed during the morning peak will drop to just 31km/h. And that's even after factoring in billions of dollars worth of planned road and rail upgrades." I agree with you Edulcor, what's occurring in Melbourne is The Crime of the Century with apologies to Supertramp. I believe that Josh Gordon is playing the nice guy while, in fact, Fairfax Media is the bad guy and that spells trouble, BIG trouble for all Melburnians. While tending the Sustainable Population Australia tent at the Sustainable Living Festival last Sunday it was surprising the number of people who were switched on to our population problems and that was over and above those who understood that there is a problem, but then deny it. However, as you mention Edulcor, most Melburnians aka Simone's friend, are sitting in the middle of the road dazzled by the bright lights of the so-called Spirit of Progress that is grinding them into the dirt. Josh Gordon in his article acknowledges the problem and its effects, the cause, but then fails to call on his employer let alone State & Federal Governments to do anything. Why pen the piece if you aren't going to call them out? Not only are our State and Federal Governments complicit, but so is private enterprise who are driving the big population agenda for the own benefit! Governments can be held accountable at the ballot box, private enterprise, however, is far less accountable and the only way Joe Public can be of influence is to not buy their products and to divest of those companies in their share (superannuation) portfolios. And as we have seen with the coal industry this can take a long time. Attempting to influence relatives and friends of the problem of overpopulation can be taxing, taking people out of their comfort zone. High levels of tact and diplomacy are required when raising overpopulation and its effects. more permanent) economic boost to Australia than the mining boom. CBA senior economist, Gareth Aird, who has recently argued that Australia’s mass immigration settings are lowering the living standards of the resident population. Deloitte Access Economics’ Chris Richardson, a pro-immigration economist who has previously called for Australia to lift its already turbo-charged immigration intake. Whether immigration is boosting living standards on a per head basis. Whether immigration can prevent Australia’s population from ageing. Deleterious impacts on infrastructure, traffic congestion and housing affordability. deteriorating traffic congestion, and worsening housing affordability. just focusing on headline GDP growth. 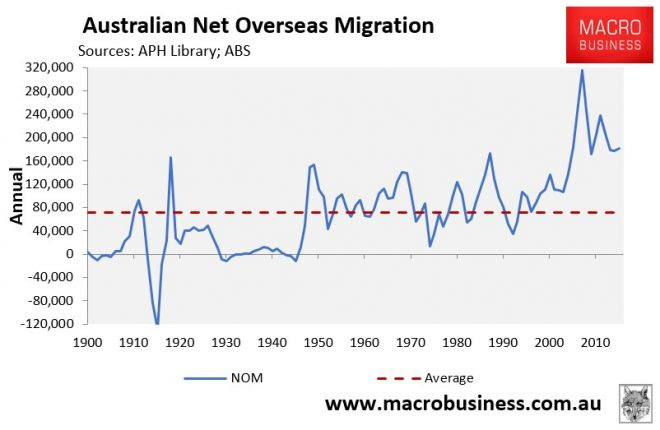 Importantly, Aird also challenges the claim made by Chris Richardson that Australia can “substantially offset” an ageing population by “getting migrants”, noting that this is a temporary fix since immigrants also grow old, and equates to “kicking the can down the road”. immigration should probably be “adjusted down”. immigration levels (see below chart). the immigration intake to more sensible and sustainable levels. It is interesting to note that Gareth Aird had to make the point about 'lived experience'. Lived experience is really the only metric that matters! The whole point of having economic growth is to improve peoples lives, but improving their experience of life. That is the point of any human institution or system. Is it not? This is what is lacking when people discuss economic impacts, and its frustrating to see time and time again, that retorts rarely make this the the first and foremost, and only point. The fact that immigrants might improve our economy by growing GDP 0.2% more is irrelevant to any argument, if that additional growth doesn't result in a better life experience. We push for growth, and feel good because the numbers are better, but what about the lived experience? What about the quality of life? Economic growth without a corresponding increased satisfaction and enhanced experience of the living conditions is useless, not worth one jot. Economic growth in Australia today are like healing crystals hanging on the walls. It costs something to obtain, people are prepared to pay to have them, but they make no difference whatsoever, except in allowing that person to argue that we should spend to do the same. When people come to me about economic growth, or how the Liberals are great economic managers, I always ask "How has YOUR life presonally improved. How are you better off, enjoying life more"? Very rare I get a positive response, and the arguments are usually economic, about their house value going up, or less debt. But rare that they can actually tell me how they have more freedom, more spending power, less financial worry. They might say the booming property market is great, but they enjoy their property less as subdivisions go up everywhere and traffic increases. They might say that growth is good, but they complain about the traffic and crowds. They say the income is great, but are worried about government debt, and their own mountain of debt. A conversation with a longtime friend has me pondering the nature of the "Globalist vs Nationalist" struggle. Marine Le Pen has stated "It's no longer left vs right but nationalism vs globalism", a sentiment which more accurately describes the key political division of our age. That is not to say that there is no Left/Right divide, but that the more pertinent divide is between a Nationalist style thinking and a Globalist style thinking, and within the Left and the Right, there are divisions between those who are Globalist and those who are Nationalist. You can make a case that people are worse off as conditions became more crowded, that life is more costly, that housing becomes less affordable, that the environment is collapsing,that schools and hospitals can't cope, that future power supplies could be problematic, that our great grand children will be born into an overpopulated impoverished environment , but still people are not satisfied unless there is plausible "economic argument" not to go down this path. It's crazy but people seem to care less about their own lives than they do about what they are told is good for them.